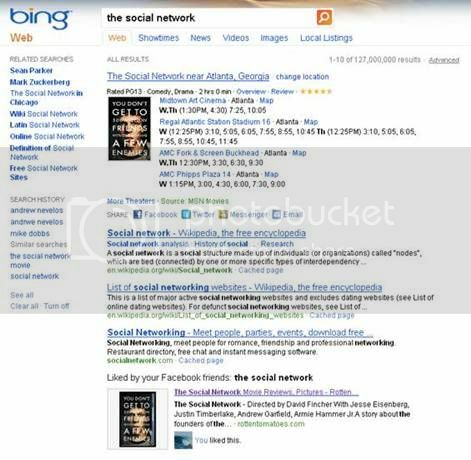 in Search Marketing with tags bing, Facebook, social search Both comments and trackbacks are closed. Since the joint announcement a few weeks ago, I’ve been returning to Bing Search daily, hoping to get a glimpse of the new Facebook integration. I’m normally a Google user, yet the idea of taking my friends along with me during search discovery just seems natural, if not logical. And, while I’m probably the exception and not the rule, most of my real relationships are also solidified on Facebook. As Facebook continues growing user adoption rates, a mirroring effect of our real and digitized social lives is becoming analogous for many online users. With this latest Bing rollout, our digitized Facebook friends will support Bing Search as we do keyword queries. I envision three of my good buddies hovering over my shoulder at home, pointing, debating and telling me which links might look interesting on a search results page. Maybe they see a web URL they’ve already visited or have Liked themselves. Now, in this virtual scenario produced by Bing and Facebook, my buddies are probably less of a distraction to my ears (or stress levels), and more so a subtle support group for my search and discovery process within Bing. After a lot of hype and waiting, one recent afternoon I finally returned to Bing, pleased to see a message that read: “Bing just got better with your Facebook friends.” My lucky number must have come up, and I received a Bing cookie to enable the HTTP connection with my Facebook account. How did I know? It was pretty obvious. I got a pop up box in the top right of Bing’s search result page, prompting me to disable (opt out) of their enhanced search experience. I left it enabled, allowing me to bring Facebook friends along as I search. Bing also provides more information about this update and the enabled benefits, some of which I’ll walk through here. So, what really changed after my Facebook connection was enabled? 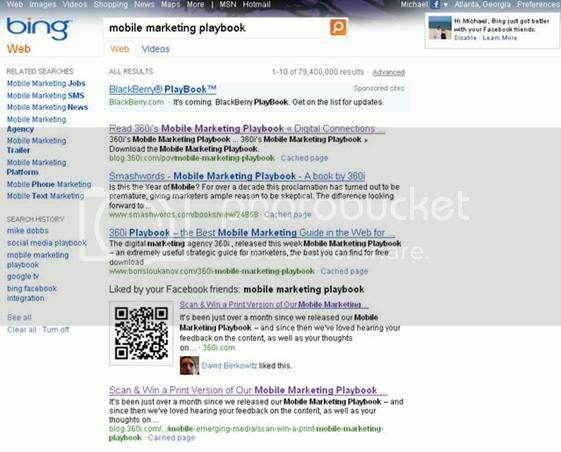 Well, I happened to be doing a search for a non-brand keyword (“mobile marketing playbook”) when the update occurred. As I scanned down the results page, it was pretty obvious the integration was a game changer. While Bing’s web rankings 1, 2, 3 showed relevant sites and links I might wish to investigate, the number four result was illuminated by my social connections. 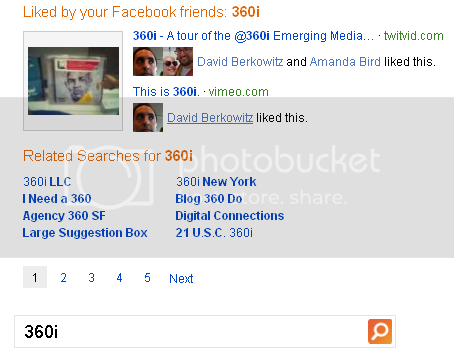 I quickly noticed that my colleague and friend David Berkowitz Likes a link to 360i’s recent blog post, relevant for my query. Everything immediately brought my eyes to this part of the results page, even if lower down! I know David, I trust David, and I see David’s face aligned with a semantically relevant link he has liked. The link has a strong title and description, relevant to my query, plus a big QR code image – hard to ignore! Below is an example of the full experience. So, let’s roll back again. Before Bing had connectivity with my Facebook friends, if I searched a person’s name, I would likely get standard, non personalized listings as shown below. Most of these results are not very relevant; I don’t know these Jason Bells. 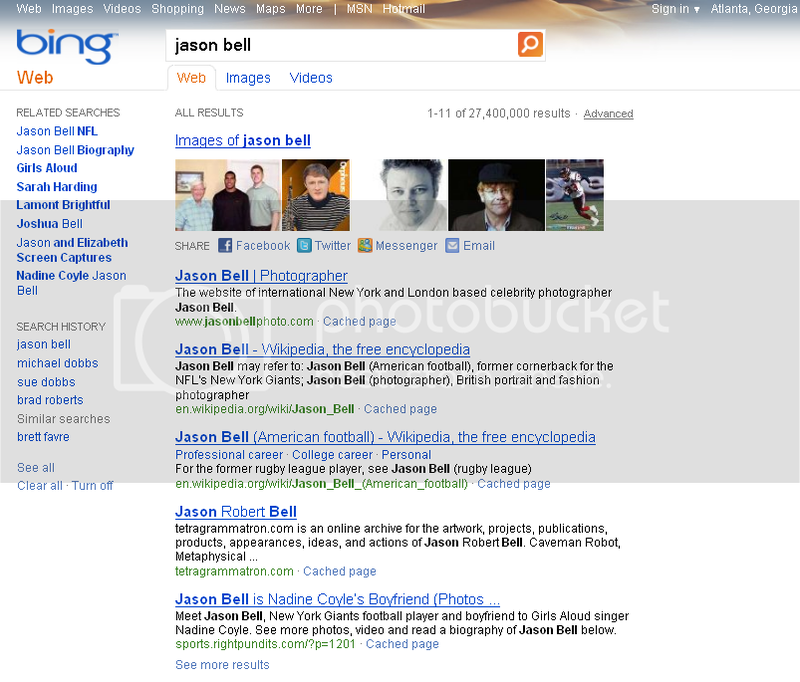 But, when my Facebook connection is enabled on Bing Search, I see several Jason Bells, those I actually have social connections with; this is a common name after all. Want more examples? I searched a movie title (“The Social Network”). Apparently, I liked a URL on Rotten Tomatoes, a web page that gave the movie a positive review. Well, I forgot I liked the URL on Rotten Tomatoes; however, Facebook did not. 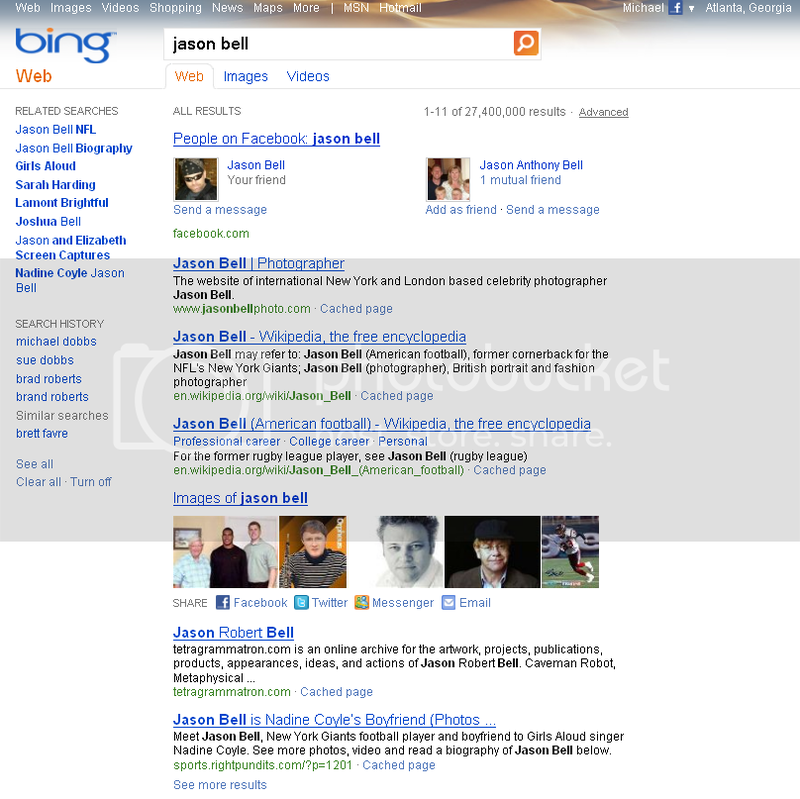 So, now Bing has reminded me of a URL that has standard SEO relevancy factors, i.e. maintaining an HTML title with the words “The Social Network,” but it even has my own social stamp of approval. Pretty cool! Now, any of my Facebook friends with this new search feature enabled on Bing, doing a search for “The social Network,” will see “Mike Dobbs Likes” the Rotten Tomatoes URL, probably leading them there, versus anther URL in the search results. Below is the full experience. Another search on a keyword “360i” shows similar influences, offering links toward the bottom of the page from Facebook Friends who Like URLs that also produce semantic relevance as pointed out above – i.e. the pages for those links have SEO factors that are relevant for “360i.” Not so different from Google’s social circles, but fueled by a larger sample of my social connections – aka Facebook. What do these changes mean to marketers? 1. Bing only has about 10% market share (Source: Hitwise July 2010) today, and this social feature enhancement is still in the very early stages of unfolding. On the other hand, Bing’s Search Alliance with Yahoo! might expedite the impact, thereby exposing another 15% (Hitwise July 2010) of the US search market, making the social and search experience a real factor. 2. In order for the potential for social and natural search to truly meld, more of our “friends” need to influence Likes on millions of web URLs. Marketers might think about accelerating that process (for their own pages) and consider implementing a like button across their pages. This in-turn will support propagating of URL Likes aiding future search interactions with those pages down the line. 3. Don’t forget SEO. These examples shown above, especially when URLs are exposed for keyword relevance, also require on-page (SEO) relevancy factors, and best practices that support a URL’s semantic relevance. Social approval will only help propagate relevance of a URL if in fact the URL is algorithmically relevant for the queried keywords in the first place. 4. Rankings just got more complex. For example, if your brand’s URL is ranked number four, but has personalized social approval, it could be more valuable than a number 1 rank without social validation. 5. Oh yeah, Google has expressed their desire to connect its search users (with permission) to our Facebook’s network of friends. Marketers can expect 2011 to be a year of real social-search convergence. Focusing on the Facebook Like per any URL as a complement of SEO factors will certainly start shaping out. Marketers will need to gain Google PageRank first, yes, but might get in front of the new social approval for URLs, those compounding at this very moment.